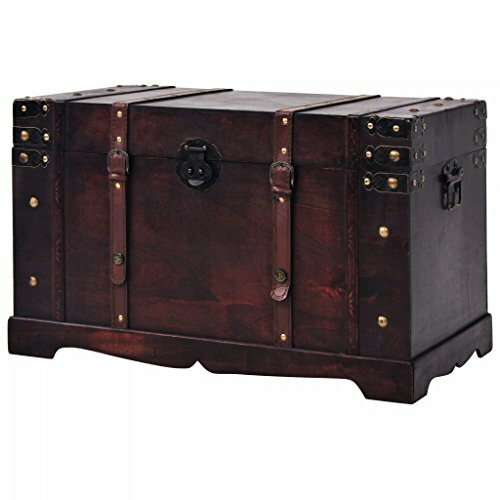 Large trunk: 9.8" x 7" x 7" and Medium trunk: 8.5" x 5.5" x 5.5" Decorative trunk that is great for storage and decoration, features lockable latch Great treasure box, lined interior Old Fashioned hardware adds to antique look Decorated with faux leatherOur warm and welcoming steamer trunk brings back days of old time. 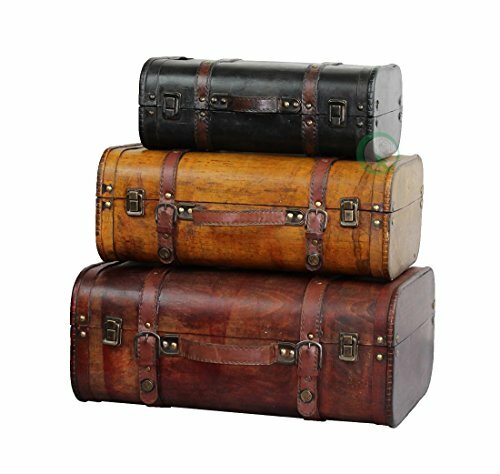 Remember how excited you are when you were a little kid to look into your grandma's old chest, our decorative trunks will bring back those memories and help you create some too. Our hope chest boxes are all handcrafted and tailored to enhance the existing decor of any room in the home. 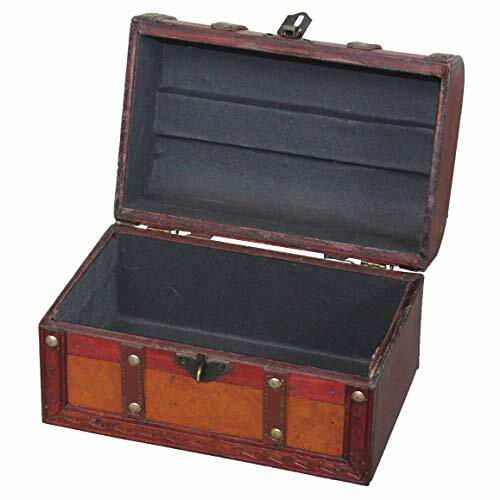 Great to use for your very own treasure chest! Large trunk: 9.8" x 7" x 7" and Medium trunk: 8.5" x 5.5" x 5.5"
The Wheeled Storage Trunk offers an ideal solution for portability and home storage needs. Its compact build allows it to be easily kept in a closet or any other out-of-the-way area. It can also be displayed as decor with its modern look, making it an enjoyable accent piece. This wooden storage trunk provides ample space to hold clothes, supplies, linens and more, while still remaining fashionable. Available in a variety of colors, neutrals and bright. This footlocker storage trunk is constructed with solid wood for a lasting performance. Heavy-gauge vinyl covering and high-impact styrene binding add to its strong construction and overall sturdiness. With large silver-colored latches and accents, it has a unique and classic appeal to enhance a room. It also features a push button key lock for added security. For extra portability, it has two recessed wheels that make it ideal for either camps or hostellers. Sturdy nickel closures with a key-locking hasp and loop to accommodate padlock (not included) offer another level of safety for personal belongings. With this traditional chest, organization or travel can be both attractive and easy. The Wheeled Storage Trunk has a functional style that is sure to benefit many different lifestyles. Perfect for back to campus, summer camp and seasonal storage needs, this collegiate style Seward Footlocker Trunk is a great way to create extra storage space in your cramped dorm room or camp cabin. 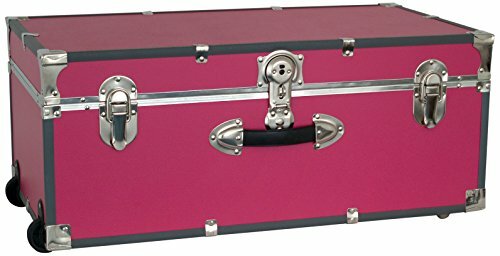 You can also protect your belongings while in transit to school or camp, and then transform your trunk to use as valuable extra storage or as a decorative piece of furniture. Features an easy open push button key lock (includes two keys) and can also be locked with a padlock for added security. Expand your storage solutions with this Seward Trunk Barracks Footlocker Trunk. 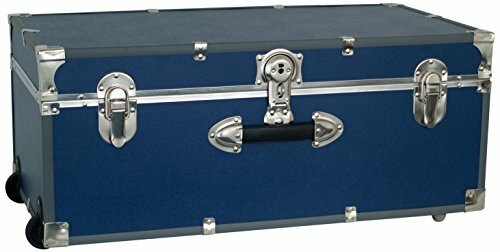 Durable wooden construction and heavy gauge vinyl covering make this trunk a reliable solution for all of your storage and organizational needs. Designed with durability in mind, the Seward trunk is made with black extruded binding. It also has a convenient carrying handle and features an easy open push button key lock (includes two keys) and tongue and groove closure. Dimensions for this black wooden footlocker are: 30 inch length x 15.75 inch width x 12.25 inch height. 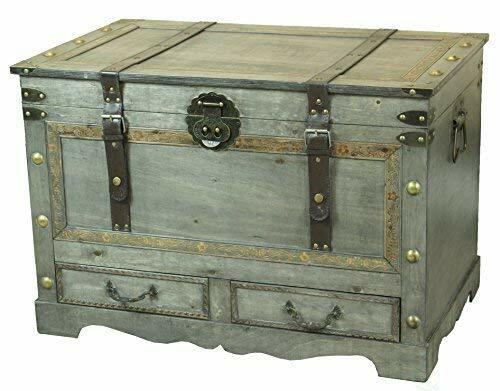 The Rustic Gray Large Wooden Storage Trunk is a handcrafted work of art. With its antiqued hardware and ornate accents, it's sure to add a bold vintage look to your home decor. Its large size provides ample storage space and allows it to double as a one-of-a-kind coffee table. Two drawers at the bottom of the trunk provide additional storage space and charming antique style. Overall Dimensions: 29.25" W x 18" D x 19.75 H; Interior Dimensions: 27.75" W x 17" D x 10.5" H plus 2.25" for lid. 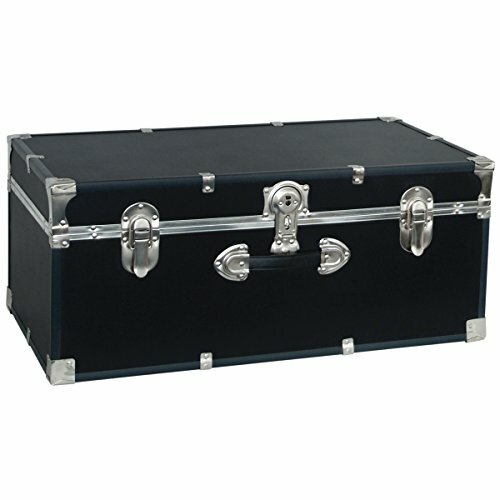 Expand your storage solutions with this Seward Collegiate Collection Footlocker Trunk with Wheels. 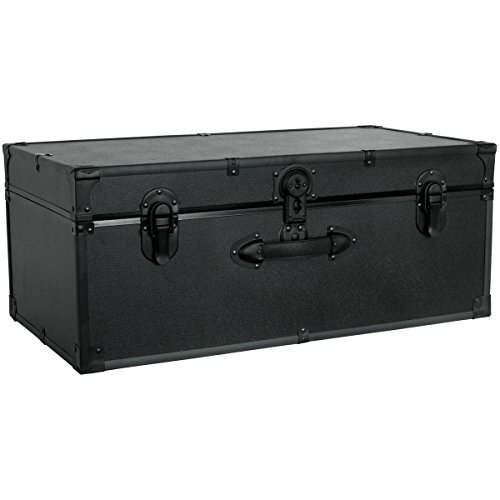 Durable engineered wood construction, a heavy gauge vinyl covering and a paper-lined interior to protect contents make this trunk a reliable solution for all of your storage and organizational needs. Designed with durability in mind, the Seward Collegiate Collection Footlocker Trunk with Wheels is made with black high impact styrene bindings, nickel plated hardware and two durable recessed wheels. It also features an easy open push button key lock (includes two keys) and can also be locked with a padlock for added security. VINTAGE STORAGE CHEST This storage cabinet features a vintage design,will make a great addition to your living room,bedroom home decor.It has a convenient latch closure and is portable thanks to two side handles. MULTIFUNCTIONAL 2-IN-1 CABINET Whether you are looking for a box with storage function,coffee table to place your food and drinks, sofa and couch table to place your itmes, this 2-in-1 storage cabinet is the perfect choice for you. SPACIOUS STORAGE This antique-style storage chest with a large compartment under the lid,helps you to keeping a wide range of items like clothes, magazines and books organized and out of sight. 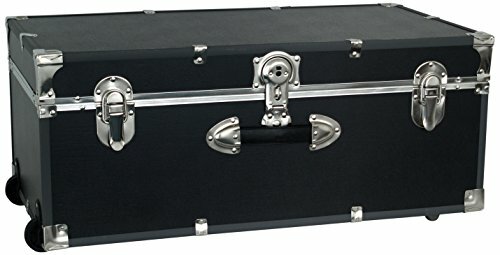 STURDY AND DURABLE The trunk is made from solid wood and chipboard,which makes it sturdy and durable for long years use. FAST DELIVERY This product is ships from United States,usually ships within 3-7 days. 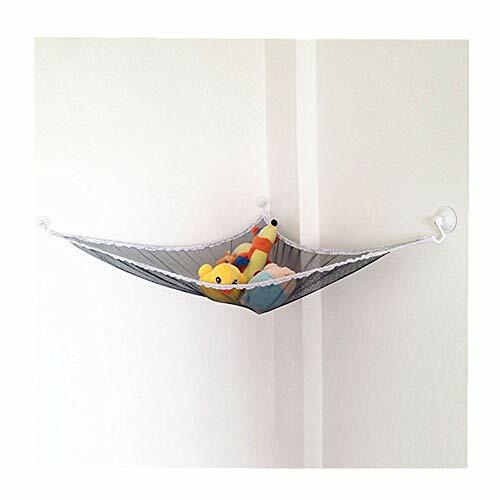 4 holes in the bottom, good ventilation, easy to clean, dry quickly. Lightweight and durable food container, convenient to use and clean. Volume Capacity: 3.2 cu ft.
  Utility trunk allows you to transport and store your duty gear. 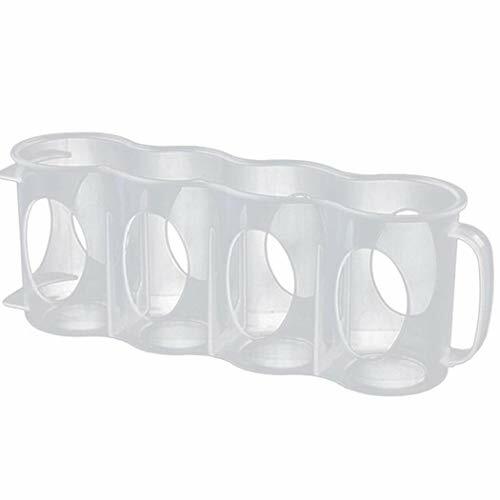 High-impact, polypropylene construction with a reinforced lid and molded grooves for sturdy and secure stacking.   Lid fits tightly and clamps down securely with heavy-duty latches. Tie down extensions allow you to secure trunk during transport. Padlock tabs for additional security.   Storage containers are a great option for housing and sorting small to medium objects. 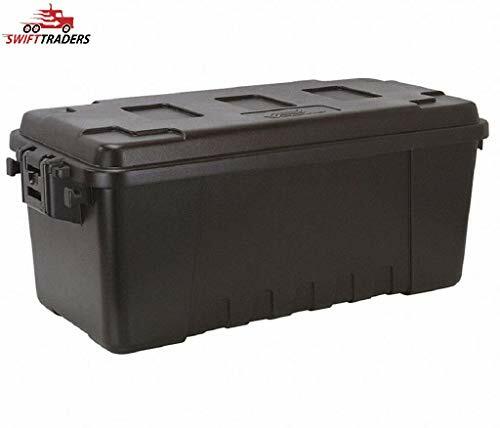 Utility Trunk include characteristics like: Material: polypropylene, Color: Black, Outside Length: 14-1/4.